Successfully Added Universal Portable Battery Charger - 17600mAh to your Shopping Cart. 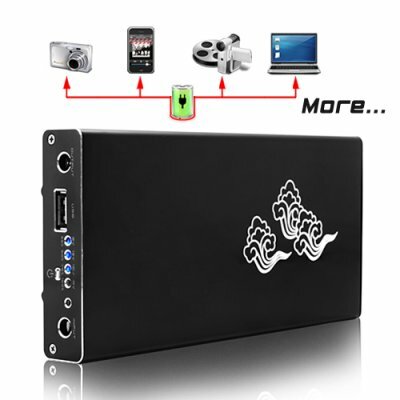 An attractively designed universal portable battery charger for those with huge power demands! This baby comes with a versatile array of connectors and stores a whopping 17600mAh of continuous current in order to charge virtually all your portable electronic devices and gadgets! The A35 slim-sized portable battery charger comes with an amazing 17,600mAh of power. It comes with 10 interchangeable adapter tips for use with thousands of laptop and cellphone models, not to mention MP3/MP4 players and portable game systems! It's slim, compact, and relatively light so it will fit perfectly in your briefcase, knapsack, or purse. Keep one in your car to provide juice to all your electronic devices on those long road trips. The benefit to you - getting many extra hours of mobile phone talking, MP3 listening, video watching, game playing excitement with this universal portable battery charger! The best part about it is that you can charge all of your electronic devices without having to bring along messy cables and adapters. Just select the correct adapter tip, plug it in, and you're ready to go! Can I get my company logo printed on the A35? Yes. If your bulk order is more than 150 we can get your company logo or name printed on this product. About 2-4 hours depending on your computer’s power consumption. Can I use my own adapter tips with the A35? We definitely do not recommended it. However, if the tips fit into the A35 then it should work just fine.